In a report that aims to give a correct picture of the extent of sustainability of a sector it is of great importance that the relevant subjects are raised. For the financial sector, reporting about themes like risk management, good governance, transparency and ethical sales techniques is essential. Environmental impact is a relatively less material theme. For sectors such as industry, it is the other way around. To guarantee that the relevant subjects were included, the stakeholders were consulted. This consultation resulted in a matrix in which the themes that were most often mentioned by the stakeholders were weighed up against the impact for the sector. 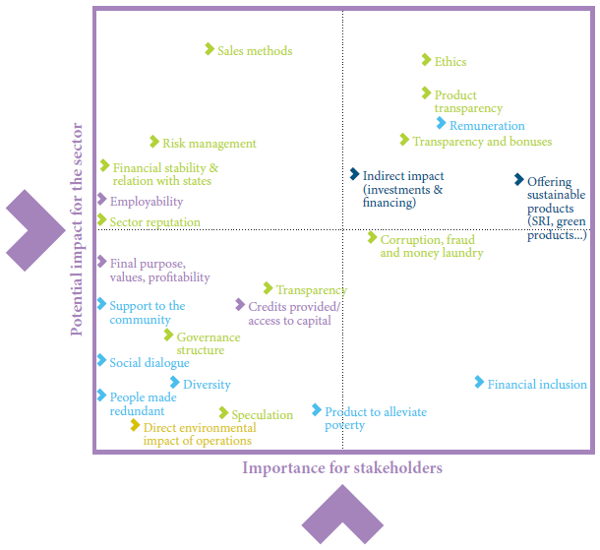 The top right quadrant contains the most relevant themes on which we will focus in this report. However, this does not mean at all that the other themes are unimportant. They were simply considered to be less determinative by the stakeholders. We chose to work around the most frequently used ESG structure (Environment, Social and corporate Governance) supplemented with the portion of the indirect social impact that is important for the financial sector via product offer. After all, via investments and lending the sector is able to specifically support sustainable companies and projects.